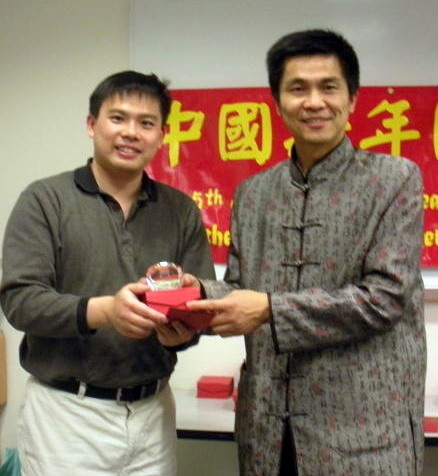 Minshan Shou 7d is this year’s New Jersey Open champion, topping a field of 109 players competing for $1,600 in prizes last weekend in Princeton, New Jersey. Xiruo Liu 7d took second place and Andy Liu 7d was third. Click here for the complete list of winners. Daniel Chou 6d (l) took top honors in the NOVA Chinese Lunar New Year tournament on on Saturday February 26 at the George Mason campus in Arlington, VA. Over 50 participated, including many youngsters. “As usual, Master Ching-Sung Chin (r) brought out many from the Chinese community,” reports organizer Allan Abramson. Sponsors included the Taipei Economic and Cultural Representative Office, AXA Advisors of Falls Church, GEICO, and the Hui Hua Community Center. “Ching-Sung also produced his annual booklet for the tournament,” adds Abramson; email chin8673@yahoo.com for a copy. Winner’s Report: 1st place: Daniel Chou 6d, 4-0; Odie Hestnes 1d, 4-0; Hong Chun Liu 1k, 4-0; Kevin Chin 3k, 3-1; Robert Ehrlich 5k, 3-0; Daniel Monahan 6k, 3-1; Gary Smith 11k, 4-0; Danny Topp 14k, 3-1; and Julian Li 25k, 4-0. Kong Jie’s slump continues. Kong Jie 9P suffered another loss on February 27 when Wang Lei 6P defeated him by resignation after only 103 moves in the quarterfinals of the 11th RICOH Cup. This loss eliminates Kong from the tournament and from defending his RICOH Cup title. BC Card Cup 2nd round. There were no big surprises over the February 26-27 weekend in the second round of play in the 3rd BC Card Cup tournament. Of the 16 players left in the tournament, Korea enjoys a considerable advantage with 11 players going into the third round while China has only 5 players left in competition. This does not at all suggest that China is out of the picture. On the contrary, in the 1st BC Card Cup, China went into the third round with only four players and Gu Li 9P won the title 3-1 against Korea’s Cho Hanseung 9P. China remains strong with veteran Gu Li, Zhou Ruiyang 5P who is currently ranked #1 in Chinese rankings (as of December 31, 2010), and Chen Yaoye 9P. The third round will be begin on March 10th and continue through March 20th. Cho U takes Kisei lead. In the fifth round of the 35th Kisei title match, Cho U 9P defeated Iyama Yuta 9P by 2.5 points on February 25, taking a 3-2 lead in the series. With two rounds left to play, Cho is only one game away from winning the Kisei title for a second year in a row. Iyama, however, must win the remaining two games if he hopes to become the next Kisei. The sixth round will be played on March 10,11. Piao Wenyao wins LG Cup. In the second round of the 15th LG Cup final, held February 23, Piao Wenyao 9P (l in photo) defeated defending LG Cup champion Kong Jie 9P (r) by resignation, sweeping the series 2-0. This is Piao’s first international title win and his third title as a professional. Given this win according to the Chinese promotion system, Piao is now a 9 dan. Click here for both game records on GoGameGuru. 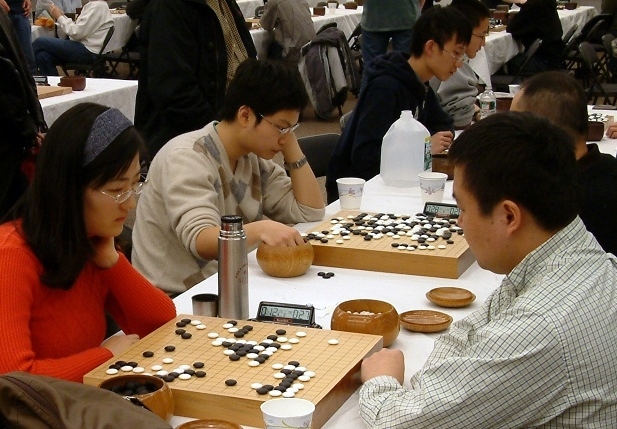 Rui Naiwei 1-0 in Female Kuksu. In the first round of the 16th Female Kuksu title match, Rui Naiwei 9P defeated Kim Yunyoung 3P by resignation on February 22. Rui has won the Female Kuksu eight times and this is Kim’s first Kuksu title match. The second round of the three-game series will be played on March 8th. Park Yeonghun vs. Lee Changho in Maxim Cup. In the last semifinal round of the 12th Maxim Cup, held on February 22, Lee Changho 9P defeated Mok Jinseok 9P by resignation. Lee now advances to the Maxim Cup finals to face Park Yeonghun 9P who defeated Choi Cheolhan 9P in their semifinal match on February 21. With this win, Lee is keeping hopes alive that his present title-less state will soon be reversed. In order to do that, however, Lee will need to defeat Park who won the Maxim Cup title in 2008. The Maxim Cup is one title that has eluded Lee. In fact, this will be his first time competing in a Maxim Cup title match. Zhou Hexi in Tianyuan finals. In the final round of the 25th Tianyuan challenger decision match, held February 21, Zhou Hexi 4P defeated veteran Yu Bin 9P by 2.5 points. Zhou will now face defending Tianyuan champion Chen Yaoye 9P for the title. Chong Han 5d (Loughborough) won his first UK tournament by taking the 8th Nottingham with ease. Also winning three games were Roger Daniel 5k (London), Maria Tabor 6k (Nottingham), David Crabtree 9k (Chester) and Andrew Russell 12k (Birmingham). 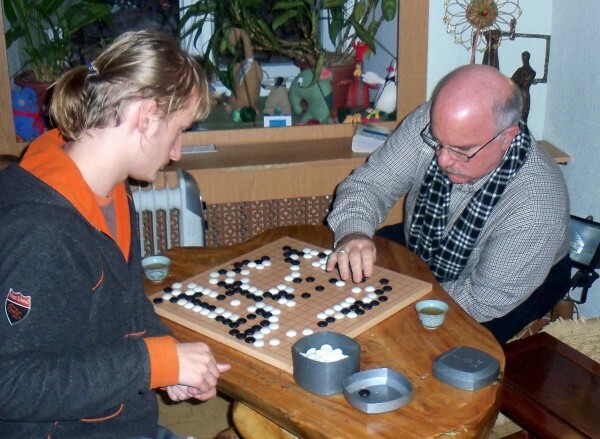 Mike Charles won the 9×9 prize and Toby Manning the quiz prize. Click here for results. The AGA’s fundraising committee is looking for a volunteer with marketing or PR experience who can “help us with the design, look and feel of the printed materials we use to seek corporate and institutional support,” reports AGA Board member Andy Okun. If you’re interested or would like to know more, get in touch with Okun at abc@okun.name. Feng Yun 9P is conducting a small-group workshop at the Hangzhou Qi Yuan in China this summer. “This is a great opportunity to study in a beautiful setting, and get stronger just before the U.S. Go Congress,” Feng Yun says. Click here for more details. Nominations for the AGF Teacher of the Year are now open. The award is presented each year at the U.S. Go Congress and recognizes an outstanding American teacher. The winner will receive an all expenses paid trip to the congress. To be eligible, a teacher must be a member of the AGA, have been teaching go to children for at least two hours a week for two years, have started a go club or organization for youth, and have helped their students enter appropriate tournaments, if possible. If you would like to nominate someone for this award, including yourself, e-mail agf@usgo.org. Piao Wenyao wins game 1 in Lg Cup final. The 15th LG Cup final began on February 21 with two of China’s top players battling for the title. Piao Wenyao 9P won the first game in the three-game series, defeating Kong Jie 9P by resignation after only 123 moves. Kong is the defending LG Cup title holder. Piao, while not having many titles to his name, is stil l ranked fairly well (12th) among Chinese professionals and is looking for his first international title. Rui Naiwei wins the Female Myeongin. Rui Naiwei 9P (r in photo) successfully defended her title for a sixth straight year on February 18 by defeating Cho Hyeyeon 9P (l) in the third and final round of the the 12th Female Myeongin title match. She won the series 2-1. 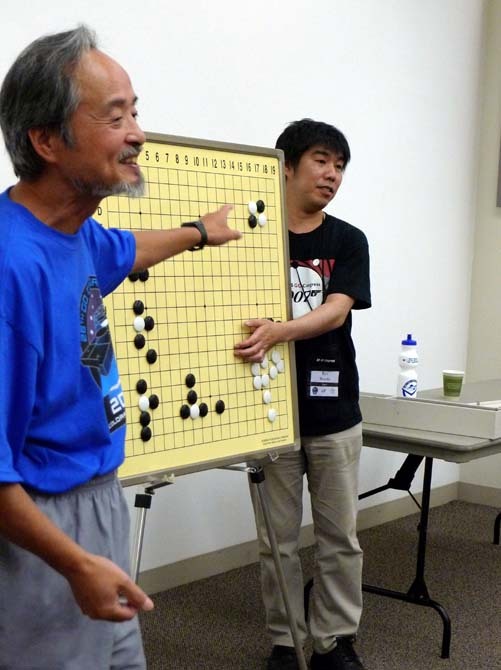 In the second round, on February 15, Cho defeated Rui by 7.5 points. This will be Rui’s tenth title win in the Female Myeongin since the tournament began in 2000. Her only loss was to Cho in 2004, which is the only time that Cho has won the title. Cho U evens the Kisei. In the fourth round of the 35th Kisei, held February 18, Cho U 9P evened the series to two games each by defeating Iyama Yuta 9P by half a point. The fifth round will be played on February 24-25. Xie Yimin wins Female Kisei. Xie Yimin 5P defeated Umezawa Yukari 5P in the second round of the 14th Female Kisei title match, winning the title 2-0. This is the second year in a row that Xie has won the Female Kisei. Note that the match was played on February 1 and made available (broadcast) on February 16.